Apogee, a luxury 30-story cooperative building in Cliffside Park, N.J., has vaulted into the upper echelon of modern, amenity-rich residential properties that are sprouting up along New Jersey’s Hudson River Gold Coast. Situated at 250 Gorge Road atop the historic Palisades Cliffs with panoramic 360° vistas of the Manhattan skyline and New Jersey landscape, the 312-unit hi-rise has undergone a multi-million-dollar modernization and rebranding campaign that has put the lifestyle offering on par with new-construction properties throughout the region. Renowned Manhattan-based architect Steve Kratchman Architect, P.C. was tapped to lead the comprehensive design and construction effort, resulting in a chic new entrance, hotel-inspired common spaces, new and improved indoor and outdoor amenities, and new state-of-the-art building systems. The wide-ranging transformation of the building centered on its soaring three-story main lobby which was elevated into an elegant new entryway with a dramatic four-sided living green wall, two-sided fireplace with a greeting and gathering area, a contemporary 24/7 Concierge-attended front desk, and an on-site dry cleaner. The inviting and trendy space serves as the gateway to a full suite of re-imagined lifestyle amenities, including an expanded and newly-outfitted fitness center, a separate Yoga & Pilates Studio, children’s playroom offering elaborate and innovative play equipment, community room, library, and a residents’ lounge with ‘genius bar.’ Residents also enjoy a full-size heated outdoor swimming pool, kiddie pool and hot tub; lighted tennis courts, and BBQ area with views of the scenic waterfront below. Apogee’s redesigned exterior blends seamlessly with the geological formation that serves as the foundation of the building, highlighted by an updated façade with a canopy fashioned out of a glass, metal and wood marquis; new driveway with modern pavers designed to be welcoming and practical for arriving vehicles, seasonal landscaping and soft-yet-elegant outdoor lighting and signage. Apogee’s upgrades extended behind the walls as well. New high-performance and efficient building systems include faster elevators, a $500,000 emergency backup generator, new boilers, upgraded electrical systems, new water distribution and treatment systems, new heating and cooling HVAC units for the common area, and state-of-the-art monitoring, fire and smoke alarm systems. 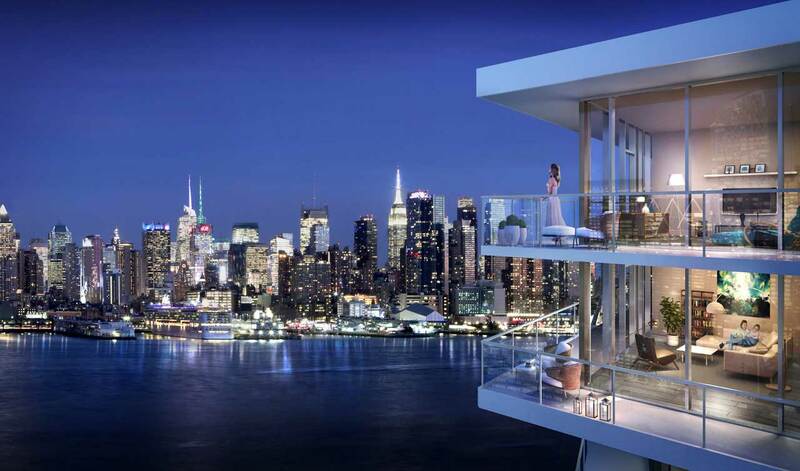 The full-scale strategic capital improvement program was the brainchild of Apogee’s forward-thinking Board of Directors which sought to significantly raise the value of the homes while tapping into the market’s appetite for expansive residences, proximity to Manhattan, incredible New York City views and access to the vibrant Hudson River waterfront. Under the watchful eye of the board, which comprises homeowners who are also seasoned professionals with wide-ranging experience and expertise, the extensive program was completed without any assessments to existing owners, underscoring the financial stability of the building. What’s more, over the past eight years, monthly maintenance has increased an average of only 1.5%, primarily due to increases in real estate taxes, while residents also benefit from being able to deduct approximately 45% of their monthly maintenance costs from their personal income taxes. “We’ve all watched as the New Jersey Gold Coast has developed around us with a wave of new, high-end residential properties and lifestyle offerings,” says Hatice Dalton, Board President. “Recognizing that we share many of the same advantages as these buildings, including location and views, we decided to take a pro-active approach and reposition Apogee through meaningful upgrades to leverage the region’s growing appeal and buyer craving for highly-amenitized, trophy buildings. The recently-completed modernization and rebrand has already had a tangible effect on Apogee home values, with recent sale prices up an average of 12.9%. Yet, with available one-, two- and three-bedroom homes on the market at prices ranging from $209,999 to $568,888, the luxury co-op building is within far greater reach of many homebuyers today than its competitors. The collection of expansive homes features open floorplans, many with balconies and breathtaking views stretching from downtown Manhattan to the George Washington Bridge. The residences range from 796 to 1,646 square feet of living space. Situated at 250 Gorge Road, Apogee is just minutes from commuter access points into Manhattan, including a NYC express bus with a stop right across the street, New York Waterway Ferry service from the Port Imperial Terminal in Weehawken and the George Washington Bridge and Lincoln Tunnel. The waterfront delights of Edgewater, North Bergen and Hoboken are all within easy reach via River Road, and Cliffside Park’s own Anderson Avenue, home to popular dining, shopping and entertainment, is less than a mile away. For more information on Apogee, visit the building’s new website at www.ApogeeNJ.com, or call 201-941-6767.